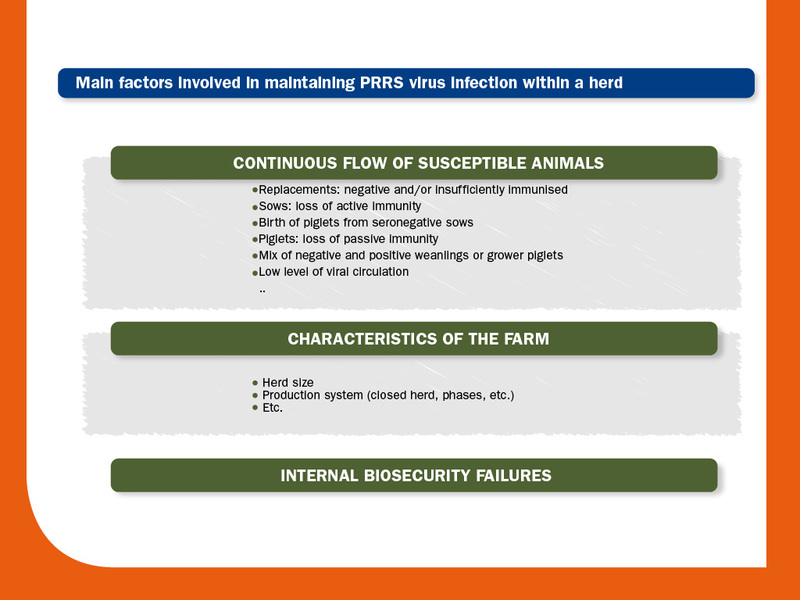 The final outcome of a PRRS virus infection on a farm will mainly depend on the virulence of the strain and the previous immunisation status of the herd. Once PRRS is introduced into a farm, it will tend to circulate indefinitely. Spontaneous elimination can occur, especially on small farms, but it is rare. The presence of persistent infection in carrier animals, together with the presence of negative subpopulations in the herd or a continuous flow of susceptible animals –replacement, birth of piglets from seronegative sows, by loss of passive immunity in piglets or by loss of active immunity in previously infected pigs- can perpetuate the infection. For example, seroprevalence in sows during an acute outbreak never reaches 100%; thus, a variable percentage of sows escape from the initial infection but seroconvert later, indicating that negative subpopulations permits a low level of viral circulation. Usually, if no measures are taken, the virus can circulate for years or indefinitely and clinical outbreaks are to be expected periodically. 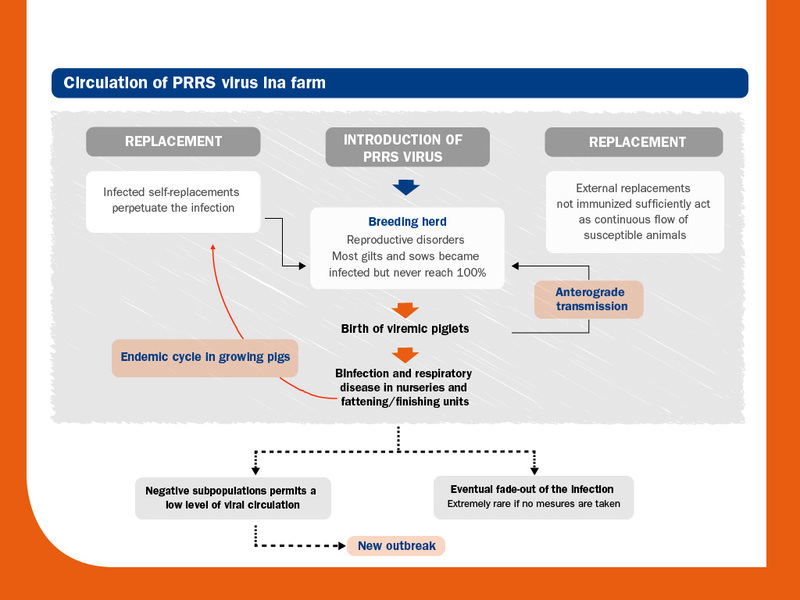 Most probably, PRRS virus infection will cause a serious outbreak (see information on reproductive failure in the section “Pathogenesis, lesions and clinical disease”). Abortions in waves (last third of gestation) over months, early farrowings, weak-born piglets, splay-leg, increase in preweaning mortality, etc. In small farms, the infection can be self-limiting; however, in most cases, the virus will continue to circulate as previously described. Under these circumstances, the dissemination of PRRS virus in weaners and growers is usually very fast. From no effect to serious outbreak. This will depend on the strain, the immunisation level of the herd and the presence of negative subpopulations. Probably, temporary impairment of productive and reproductive parameters. Again, presence of negative subpopulations can be crucial.